Are the YotaPhone's two screens really better than one? 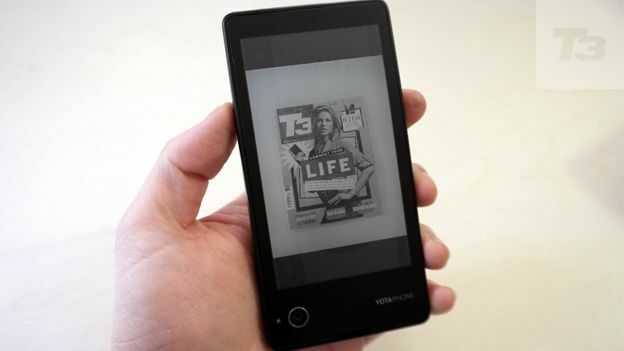 The YotaPhone is the first smartphone to experiment with a technology that has been around for years, but never fully been implemented in anything other than on E-Readers and early smart watches. Of course, it's not the first smartphone to try and include an unconventional feature as a selling point, the Samsung Galaxy S5 includes a heart rate monitor while the Sony Xperia Z2 is completely waterproof. Its E-Ink display is not only meant as a helpful tool but a meaningful alternative to the truth, which is that the more powerful our smartphones get, the more their batteries suffer. The question is, does it provide a good enough end product to answer both those points? The maker has already unveiled at follow-up model - the YotaPhone 2 - at the MWC show in Barcelona, but it's taken this long for this – the first version – to turn up on UK shores. Pick the YotaPhone up and immediately it's clear that while this may not be from a well-known manufacturer, Yota Devices has in no way skimped on build quality. On the top you'll find the headphone socket and a SIM-card slot that also doubles as the power/lock screen button, it's a neat feature and despite doubling up it feels solid. Its sturdy plastic body feels extremely solid and well built while the wedge design is an interesting idea well executed. If we had any reservations it's simply that there's too much wasted space, the bezels are too large, especially at the top and bottom making the screen feel smaller than it is. The main screen is not Full-HD, instead Yota has opted for a 4.3-inch 720p display. That said it does boast 320ppi and as a result looks pin sharp. Colours are slightly washed out so don't expect the same levels of colour pop that you'd get on the Nokia Lumia 1020 or indeed on the Sony Xperia Z1 Compact. On the back you'll find the USP of the YotaPhone, a 4.3-inch 360x640 E-Ink display that will remain active even if the phone runs out of battery. Sadly this is not the highest-resolution EPD panel at only 170ppi and it shows. There's also a severe lack of contrast as well as a delay in responsiveness that would put even the original Kindle to shame. That's not to say it isn't well implemented physically, the back feels just as sturdy as any normal smartphone thanks to a seriously tough backplate. The YotaPhone comes running an almost-vanilla version of Android 4.2.2 with the only additions being an extra menu tab to access the back-screen apps as well as gesture recognition, which allows you to send a screenshot of the LCD display to the E-Ink screen. Jelly Bean is a good enough operating system, but we would have liked to see at least Android 4.3 or even KitKat. There's also the problem that the UI just looks inefficient on the 4.3-inch display with too much unusable free space on the home screens. That said, the apps Yota provides for the rear-display are impressive, they all work well as stand-alone apps and the ability to send information like upcoming appointments and the latest news to the rear-display is a neat trick that saves on battery. Despite this, there's a problem with the hardware implementation of these features. Rather than have soft keys or even onscreen keys the YotaPhone uses a touchscreen strip on the front and back of the phone beneath each display. For the LCD a side swipe goes home while a double tap brings up your recent apps, on the back a side swipe unlocks the display and a double tap brings up your last YotaPhone app. In principle it sounds simple enough, but there are two problems: the front strip just isn't intuitive, it's time consuming and doesn't feel like a natural action. The back strip isn't responsive enough with the result being that trying to read an eBook becomes a chore as it'll take several swipes to change the page. Quad-core fanatics look away, this is another phone that has opted for the good old dual-core processor and we can see why, there's simply no need. Instead the YotaPhone has a 1.7GHz dual-core Krait processor along with 2GB RAM. On a day-to-day basis we found that to be more than enough, the phone never really stuttered. Battery life is impressive, of course, that could be due to the fact you start checking the rear-display for notifications instead of the LCD, but that is the point. The YotaPhone comes with a 1800mAh battery, more than enough considering it's only powering a dual-core processor and a 720p display. We got a very comfortable day's mixed usage out of it with the phone being unplugged at 8am and then being charged again at around 7pm. On the front you'll find a 1MP front-facing camera while on the back there's a 13MP camera that's on the bottom rather than the top. Yes you heard that right and while it certainly makes the YotaPhone stand out, in practise it's more of a nuisance than anything else, portrait shots become problematic as you'll find yourself accidently covering the lens. A silly but nice touch to the camera app is the fact that the E-Ink display turns into an image of a retro camera letting those on the receiving end know when you're about to take a shot. The camera app is less inspiring unfortunately. Pictures in low light are grainy, while the focus reticule seems to cancel itself the moment you move the phone, forcing you to constantly tap on the screen. The fact that the Yota Phone even exists is a great thing. Smartphone manufacturers should be more adventurous, testing out new technologies and actually putting them in the hands of the public. Of course, that doesn't mean they'll get it right first time, just look at the original Samsung Galaxy Gear. In this case the original YotaPhone is a solid first step, but it's not at the stage where we'd recommend it over a single-screen device. Similar to the LG G Flex and the Galaxy Gear this is a device for early adopters only, if you want something that feels truly polished then we'd say hold out for the second-gen handset (YotaPhone 2), which looks significantly better in all areas.